Our KennelSpace staff have over 15 years of kennel design and construction experience , combine this with the benefits of our unique structural system and you begin to understand why existing kennel owners are choosing our system. The significant benefits of unrivalled insulation, the best soundproofed kennels on the market and a long term durable lifespan means that customers can buy with confidence. Our breeder kennels are the ideal long term solution if you are looking for a kennel for breeding or just housing your family pet. 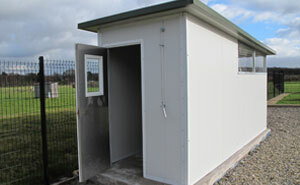 We manufacture kennels to house from one dog through to many dogs as we build whatever kennel size and layout you need. All our kennels are produced to our customers specifications so we can build any size of sleeping areas or run areas, there are no restrictions on size so in fact you will be getting a bespoke solution. Never before has a kennel manufacturer designed such a high specification kennel and our breeder kennels are manufactured to exactly the same specification as our larger commercial kennels. This means that you can experience all the benefits of a commercial kennel designed for durability and longevity. All our breeder kennels are manufactured from our unique structural composite material that offers many benefits over grp and other plastic kennels. 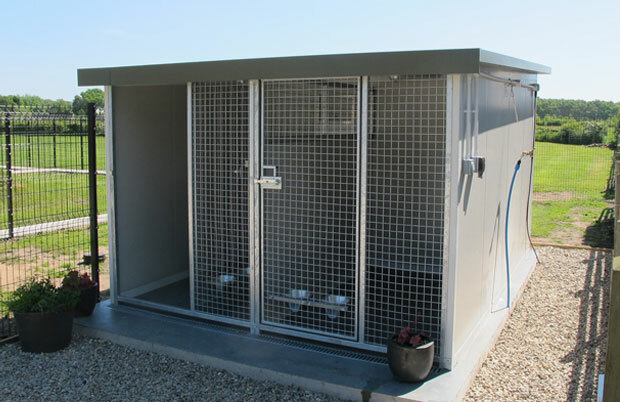 Our kennels are the most thermally efficient on the market and you can choose from 40mm, 60mm or 100mm thick walls and roof, this will make a fantastically warm kennel even in the coldest of winters and also keeping the kennel very cool in the hot summer months. All the door systems are fitted with key operated security locks so you can have total peace of mind when leaving your dogs unattended. If you are looking for a new breeder kennel then why not fill in the following enquiry form and discuss this with one of our experienced and friendly members of staff. A Central Corridor kennel is the most efficient way of utilising floor area within a kennel, it also has the benefits of being the most efficient to staff. Our Single Row Corrridor Kennels are the most popular type of commercial kennels. 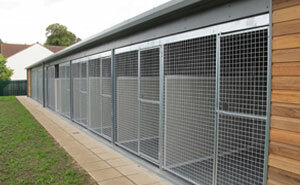 Available with and without a security corridor this kennel system can be designed to house any numbers of dogs. Sign up to our newsletter for uniqueoffers and the latest news on products.